It was a short day for the remaining players in Event #54. Players dropped off the map quick in the early levels after a few moments of stagnant action at the start of the day. 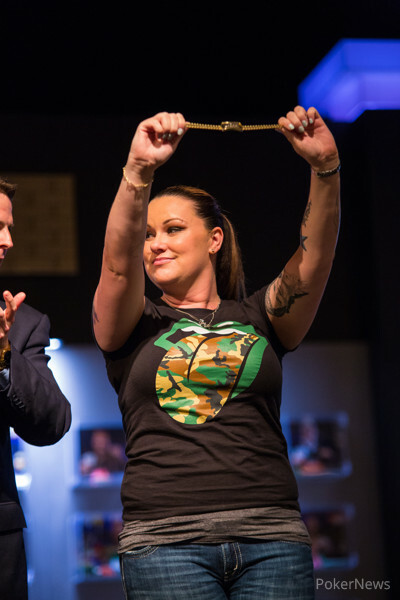 At the end of it all, Dana Castaneda was crowned the champion, becoming the first female open event winner other than Vanessa Selbst since 2007. According to Castaneda, the only reason she even played the event was because of her 94th place finish and cash in Event #51: $10,000 Ladies No-Limit Hold'em Championship. Action began the day with 14 players left, and very quickly there were only nine left. First to fall was Orjan Skommo who shoved his into Joseph Wertz's . Skommo didn't catch up and he was the first casualty of the day. Next to go was Thomas Hall who started near the top of the chip counts. Hall lost several races in a row and ended up getting his money all in against Michael Zucchet. Hall flopped a set but a runner-runner straight sent him packing in thirteenth place. Next to go were Rupesh Pattni and Molissa Farber who both began the day short stacked. That brought players to the unofficial ten handed final table. It was Nicco Maag who fell just short of the final table when his couldn't outrun pocket fours. 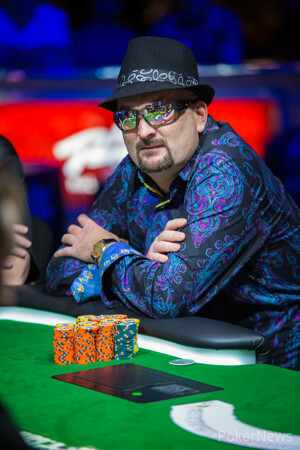 This brought the players to the final table where the first to fall was Kenneth Gregersen. Gregersen got his money all in for a race with Barry Hutter. Hutter hit the river hard to send Gregsen home with ninth place pay. Then, in a stunning turn of events Jason Bigelow eliminated both Joseph Wertz and Jacob Bazeley. Bigelow woke up with aces over a shove, and a reshove and they held through the runout to take him into the chip lead while scoring a double knockout. 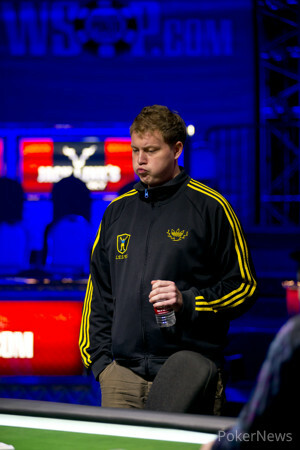 Going out in sixth was Barry Hutter, who began the day, and the final table as the chip leader. Hutter had lost a lot of traction and doubled up several players including Dana Castaneda, the eventual winner. In his final hand, Castaneda made a tough call against Hutter with a pair of threes on a board. Hutter held for an airball and Castaneda notched the knock out. She also picked up the chip lead which she would never relinquish. Philippe Clerc was eliminated in fifth place when he moved in with a straight draw against Michael Zucchet's aces. Clerc didn't catch up and that was the end of his tournament. The final four players were very close to evenly stacked when four handed play began, but one by one they dropped until only one was left. First to go was Michael Zucchet who shoved all in with a semibluff, and couldn't catch up to Castaneda's made hand. Going home in third was Matthias Bednarek. Bednarek got it all in preflop with but it was no match for Castaneda's . Castaneda flopped a and it was off to heads-up play. Jason Bigelow looked as if he might turn the tide of the match in his favor after stringing together several pots in a row, but in the end, he got his money in with a flush draw against Castaneda's two pair. The flush never came and Bigelow was eliminated. Castaneda was able to lock up the victory and the bracelet with that hand. We are sure to see Castaneda again soon as she informed PokerNews.com reporters yesterday that she would be using her winnings to play in Event #62: $10,000 No-Limit Hold'em Main Event. That does it for us at PokerNews.com. Thanks for staying with us through it all and make sure you stay tuned for updates through the rest of the 2013 World Series of Poker. Hand 115: Jason Bigelow limped from the small blind, and Dana Castaneda checked her option. Castaneda bet 125,000 on the flop. Bigelow raised all in, and Castaneda called. Castaneda was ahead with her two pair, sevens and fives, but Bigelow had a flush draw. The on the turn helped neither player, and the river card improved Castaneda to a better two pair. Bigelow missed his flush, and Castaneda won the pot. Bigelow was eliminated from the tournament in second place, earning $281,991, leaving Dana Castaneda as the sole survivor in the event. Hand 113: Jason Bigelow raised to 150,000 and won the blinds and antes. Hand 114: Dana Castaneda limped from the small blind and Jason Bigelow checked his option. The flop came . Bigelow bet 75,000 and Castaneda called. The dealer then turned the , and both players checked. The completed the board on the river, and Bigelow bet 150,000. Castaneda called, and Bigelow showed for a missed straight draw. Castaneda turned over and won the pot with her pair of tens. Hand #107: Bigelow limped on the button and Castaneda checked. On the flop both players checked to the turn. There, Castaneda checked to Bigelow who bet 100,000. Castaneda called. The river was the and both players checked again. Castaneda showed for a full house and it was good enough to take down the pot. Hand #108: Castaneda limped on the button and Bigelow checked. Both players checked until the board read and Castaneda was able to take down the pot with for jack high. Hand #109: Bigelow raised to 120,000 and he met an all in reraise from Castaneda. Bigelow folded and Castaneda showed while taking down the pot. Hand #110: Castaneda raised to 130,000 on the button. Bigelow called. The flop came down and Bigelow checked to Cataneda who fired out 150,000. Bigelow reraised all in and Castaneda folded. Hand #111: From the button Bigelow raised to 130,000 and he took down the blinds and antes. Hand #112: From the button, Castaneda limped. Bigelow checked his option. The flop came down and Bigelow checked to Castaneda who put out a bet of 90,000. Bigelow folded. Hand 101: Jason Bigelow raised and won the pot. Hand 102: Jason Bigelow got a walk in the big blind. Hand 103: Jason Bigelow open shoved from the button, and Dana Castaneda folded. Hand 104: Jason Bigelow got another walk in the big blind. Hand 105: Jason Bigelow limped from the small blind, and Castaneda checked her option. Both players checked the flop. Castaneda checked again on the turn, Bigelow bet 75,000, and Castaneda folded. Hand 106: Dana Castaneda raised to 130,000, and Bigelow folded. 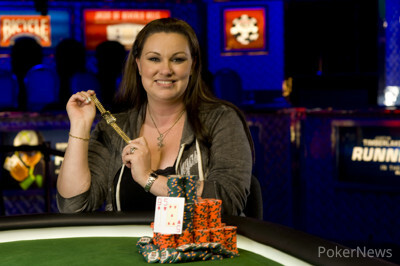 Hand #96: Castaneda folded her small blind and Bigelow picked up the pot. Hand #98: Castenda folded her second small blind in a row. Bigelow showed his from the big blind and scooped the pot. Hand #99: From the button Bigelow raised to 125,000. Castaneda called. On the flop Castaneda checked to Bigelow who bet out 150,000. Castaneda called quickly after checking her cards. The turn was the and Castaneda checked to Bigelow again who checked behind. On the river, Castaneda led with a bet of 300,000. Bigelow folded and Castaneda took the pot. Hand #100: Castenada opened from 175,000 from the button and took down the blinds and antes. Hand #92: Jason Bigelow raised to 100,000 under the gun, and Dana Castaneda called from the big blind. The flop came . Castaneda checked, and Bigelow bet out. Castaneda folded, and Bigelow took the pot. Hand #93: Matthias Bednarek raised to 100,000, and both other players called. The flop came . Castaneda checked, and Jason Bigelow bet 150,000. Bednarek called, and Castaneda raised all in. Bigelow and Bednarek both folded, and Castaneda won the hand. She showed the as the dealer was pushing her the pot. Hand #94: Dana Castaneda limped from the button, Bigelow folded from the small blind, and Matthias Bednarek raised all in from the big blind. Castaneda folded, and Bednarek took the pot. Hand #95: Mattias Bednarek limped from the small blind, and Dana Castaneda raised to 200,0000 from the big blind. Bednarek then raised all in, and Castaneda called. Castaneda was in a dominating position, which got even better when the flop came . The on the turn sealed Bednarek’s fate, and the river was as meaningless . Bednarek was eliminated in third place, earning a $198,883 payday. Hand #87: Matthias Bednarek raised to 100,000 from the button and he got one call from Dana Castaneda in the small blind. The flop came down and both players checked. On the turn, both players checkced again. The river came down the and Castaneda pout out a bet of 175,000 which drew a call from Bednarek. Castaneda showed for a pair of fives with deuces on the board and it was good enough to take down the pot. Hand #88: Castaneda opened to 125,000 from the button. From the big blind, Matthias Bednarek reraised all in. Castaneda announced "No way," and mucked her hand. Hand #89: After a limp from Bednarek from the small blind, Castaneda shoved from the big blind and took down the blinds and antes when Bednarek folded. Hand #90: Castaneda raised to 100,000 from the small blind. From the big blind, Bigelow moved all in and took down the blinds and antes when Castaneda folded. Hand #91: From the small blind, Bigelow called. Matthias Bednarek checked. On the flop, Bigelow led for 75,000. Bednarek folded and Bigelow took the pot.